In a large bowl, using clean hands, knead ground beef, sausage, bread crumbs, milk, egg, and spices into a dough. Pour oil into the dutch oven and spread it around with fingers to coat surface and coat fingers. 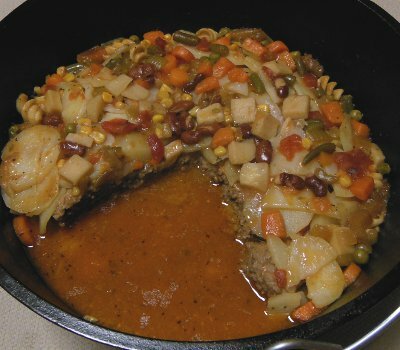 Flatten meat mixture into the bottom of the dutch oven with your fingers. Lay potato slices on meatloaf. Sprinkle potato slices with salt and pepper. Bake at about 350 degrees for about 1 hour. Let me know how you enjoyed your Hot Dish!